My experience with the Galaxy S5 finger scanner has been patchy to say the least. When I first used the device at Mobile World Congress I found the scanning process quite clumsy and inaccurate and didn't think I'd actually use it. Then when we got a review unit I used it more and found it to be more accurate and didn't mind it so much. Then I tried to shoot this video and it all went pear-shaped. 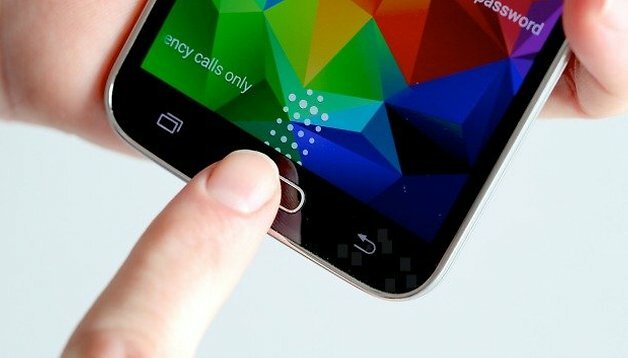 Here's how to use, and not use, the Galaxy S5 finger scanner. First thing's first, the finger scanner feature is accessed in the S5's settings menu under Quick Settings. Tap that fingerprint icon to access the main scanner menu. Here you'll find your fingerprint registry, lock screen method and other features to enable your fingerprint to serve as your Samsung account verification or PayPal authorization. You can register up to three different fingerprints and they don't all need to be yours (if you share your phone with someone else regularly). When registering your fingerprints you'll need to swipe your finger over the Home button several times to ensure your print has been registered. If you don't swipe over the whole Home button you will be prompted to do so. Also, if you do it too fast or too slow it won't register properly. I tried swiping sideways but the S5 is too smart to fall for that trick. Although you are meant to unlock with a downward swipe I did manage to fool the S5 into unlocking with an upward swipe. Just cos. Not that you'll see that in the video though (I used my thumb to trick it). You'll also be prompted to enable the finger scanner as the unlock method once you've registered your fingerprints (they only stay on your device, Samsung won't get ahold of your precious fingerprints). Once your prints are registered you can simply switch the scanner on and off like any other unlock method. Once these steps have been done, you can choose to use your fingerprints to unlock your device as well as verify your Samsung account or use PayPal services. Be careful with these features though if you have other people's prints registered as well. Quick tip: try to register your fingerprints in natural ways – ie. the way you actually hold your S5. If you do the awkward down swipe with your pointer finger it's not likely to be a very familiar way to unlock your device. While you can't see it in the video, my recent experience with unlocking the device in a natural position has been quite good (although it hasn't for my fellow editors). But then as soon as we tried shooting the video it all went to hell. I'll assume it was the slightly awkward position I held it in whilst having our cameraman leaning over my shoulder, but it's really more accurate than it might appear. It's still far from perfect though, as the funny memes and GIFs all over the interwebs will attest. Just like the Apple TouchID scanner, the S5's scanner has been hacked already too. It's safe to say that the Galaxy S5 has done no better or worse of a job of a finger scanner than any other Android manufacturer, but sadly, all of the Android attempts fall way short of the intuitive and accurate Apple sensor. Yes I said it, but it's true. I suspect most Android owners with finger scanners no longer use them, whereas the TouchID sensor is a daily feature for most iPhone owners. No matter what the case, they are far from secure and shouldn't be relied on as a solid security feature. Have you used a fingerprint scanner before? What do think the future of smartphone security will be? I started using the scanner and like the article suggests I have stopped using it. I just had too many instances of trying to unlock my phone one handed and it not working that I almost threw my phone at the wall in frustration. I have gone back to the trusty PIN that I can use one handed. Hi, Yesterday I decided to start using this, and it doesn't recognize my fingerprint, What should I do? I agree. Perhaps we should wait for the next big thing - retina scanner!